The Next Generation of Engine Dyno Simulation Software is Here Now! Build, Test and Dyno in Minutes! 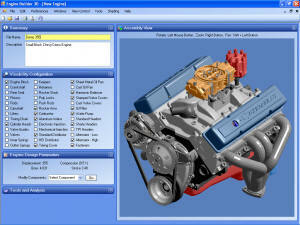 Virtual Engine Dyno is a computer software program used by engine shops and performance enthusiasts to simulate Building, Modifying, Tuning and Dyno Testing automotive engines before component purchases and engine assembly. Using Virtual Engine Dyno, Engine Horsepower, Torque, RPM, 1/4 and 1/8 Mile ET and MPH are instantly calculated. Engine changes are only a mouse click away allowing users to find the best engine combination before component purchases. Virtual Engine Dyno is the only choice if you are serious about making power! 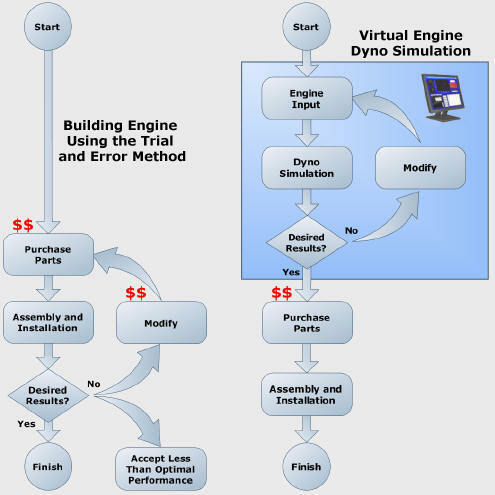 Virtual Engine Dyno - The industry standard for dyno simulation. Camshaft Selection Utility - Pick the best camshaft and compression ratio. Engine Builder 3D - Simulate building your engine on your computer. Haulin Azz Drag Racing Game - Action Packed Drag Racing Game. Look for the Budget Icons on the Purchase and Download Page. Feel the raw power, passion and speed as you pilot some of the most powerful classic, muscle and performance cars ever built down the 1/4 mile strip! Hone your reaction times and dial your ET as you strive for the perfect run in the Bracket classes or drive on the edge of control in the Heads Up Outlaw class. 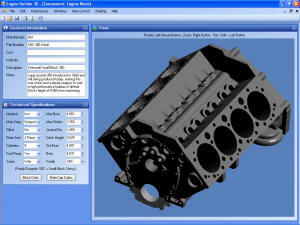 Product Focus - Engine Builder 3D! Previously affordable only to large corporations with teams of dedicated engineers, our new 3D Virtual Engine Building Program is designed with the individual user in mind. Export engine data files directly to Virtual Engine Dyno Simulation. Easily Design new and analyze existing engine components and combinations such as engine blocks, crankshafts, connecting rods, pistons, camshafts, valve train, cylinder heads and more. Applicable for Small Block Chevy V8 Engines Only. Order now and save with our introductory pricing! 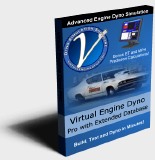 Virtual Engine Dyno Professional and Virtual Engine Dyno Professional with Extended Database are on sale. Visit our Purchase and Download page to get your copy today before time runs out!